This was a day of repairs. The fun began at 7 a.m., when I pulled the car out of the garage and noticed the “check engine” light glowing on the dashboard of my nine-year-old Subaru. Luke got in the car and said, “Oh yeah, that light was on last night when I drove home from soccer. I just coasted as much as I could.” I gingerly drove Luke to school — luckily only about five miles round-trip — and called the Subaru dealer as soon as I got home. They were overbooked, but a local garage was able to check out the car and drive me back home while they did so. While I waited to hear from the garage, I dealt with problem #2: our land line, which had been producing nothing but a busy signal since yesterday afternoon. Right now, most of you are heartily endorsing my husband’s repeated requests to just ditch the darned land line already. Here’s the thing: Our house phone is through our cable company, along with the internet access and all those great tv stations. For reasons known only to their accounting department, when I’ve tried to eliminate the phone portion of our contract, the price goes UP. Yes folks, it’s cheaper for us to keep the land line than it is to switch to cell phones only. Four cell phone calls (and numerous jogs up and down stairs to gather and test all the phones) later, we learn that the problem is not with the phones or the line, but with the ancient modem. But I can’t just buy a modem; I have to get a specific modem from the cable company (which they claim will be free), after a home visit from a technician (again, free). So they say. Which means I have to clear a path through my sadly neglected office to the modem. The car folks called to inform me that a mouse has eaten through a wire in my car’s innards. So now I have to clear out the garage as well, to eliminate any secret mouse hideaways. Last time I cleared out the garage, I found not only a dead mouse, but also a dead snake. Not looking forward to this. At all. I feel the need for a fortifying lunch, something healthy and fabulously delicious to give me the strength for all this cleaning. I have half a loaf of ciabatta, and some cremini mushrooms, feta, and a bag of baby spinach in the fridge. While the bread is toasting, I sauté some mushrooms and a sliced shallot, then added a few handfuls of spinach. Off heat, I crumble in a chunk of feta, and mound the whole lot onto the toasts. 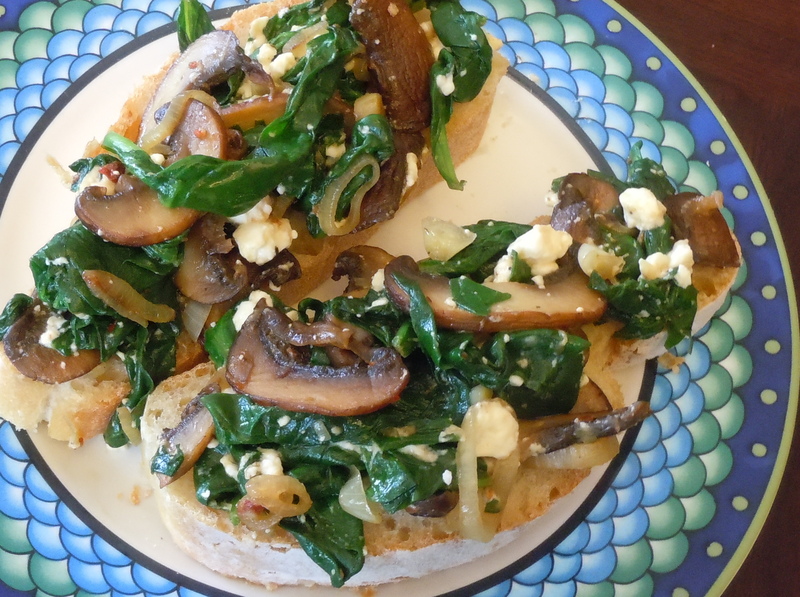 The silky spinach is a lovely contrast to the crisp ciabatta and earthy mushrooms, and the salty feta provids the seasoning. After such a lunch, I may even be able to face down the garage. Toast or grill the bread lightly on both sides. While the bread is toasting, sauté the mushrooms and shallots in the olive oil over medium-high heat for about 5 minutes, until they’re tender and lightly browned. Sprinkle with the aleppo. Rinse the spinach, shake off some of the water and add to the pan with the remaining water clinging to the leaves. Cook for a couple of minutes, just until the spinach is wilted. Take the pan off the heat, stir in the feta and mound the whole mixture onto the toasts. Enjoy while they’re still warm, and feel your energy levels soar. 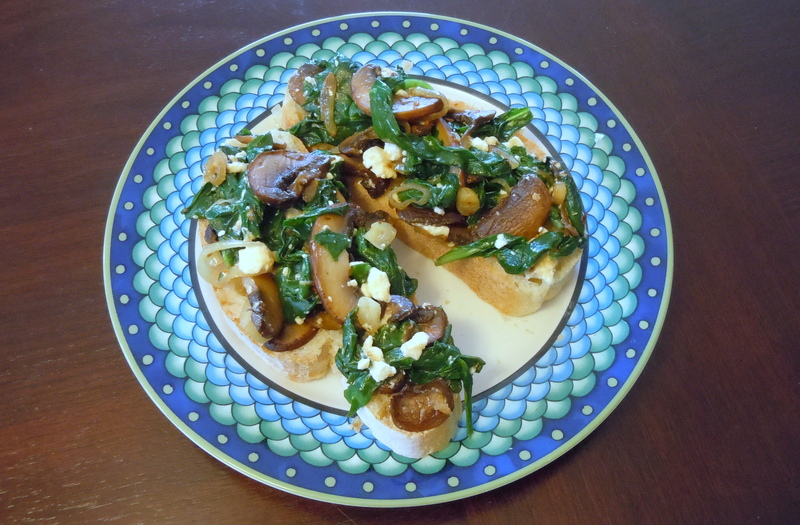 This entry was posted in appetizers and tagged bruschetta, cremini, crostini, feta, mushrooms, spinach. Bookmark the permalink. Aleppo pepper? I wonder if you could address a post to different kinds of peppers, and why you like them for different things. What a great idea! I use dried aleppo pepper of Penzey’s; it’s a chile from Turkey that’s sweet and smoky with just a little heat. We put it in absolutely everything. I’ll try to post something soon on peppers.